Move over, creamed spinach! 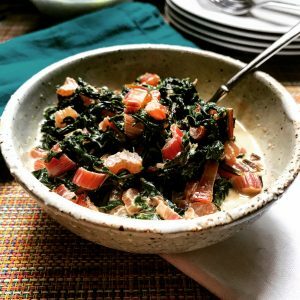 I want MORE NUTRIENTS and MORE DELICIOUS – definitely worth making this super simple creamed Swiss Chard! Chop the Swiss chard stems into ¼” thick pieces and the leaves into long ribbons. Melt the butter in a large frying pan over medium high heat. Add the chard, garlic powder, onion powder, and salt and sauté until leaves are wilted and stems become fork tender, about 8 minutes. Lower heat to medium and stir in cream and mascarpone. Allow to simmer until sauce thickens slightly, about 5 minutes. Transfer to a serving dish and enjoy!